Fish maw is sun-dried swim bladder of fish. There are two kinds of fish maw, deep fried and non-deep fried. Both are used in savory dishes like soup, stew or stir fry. While the deep dried fish maw have a marshmallow-like texture, the non-deep fried fish maw have a soft and glutinous texture, somewhat similar to beef tendon. Non-deep fried fish maw is used to prepare this dish. 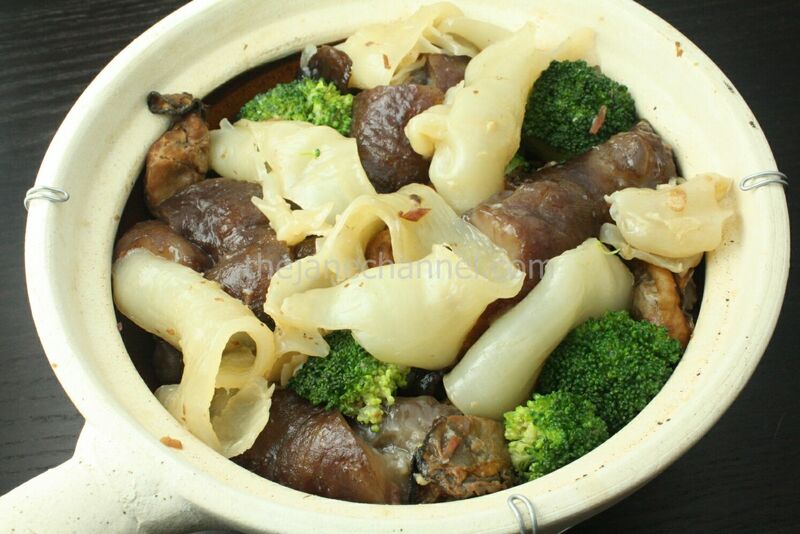 Fish maw has no flavor in itself and therefore need the flavors from dried oyster, dried scallops and dried ham in this casserole. 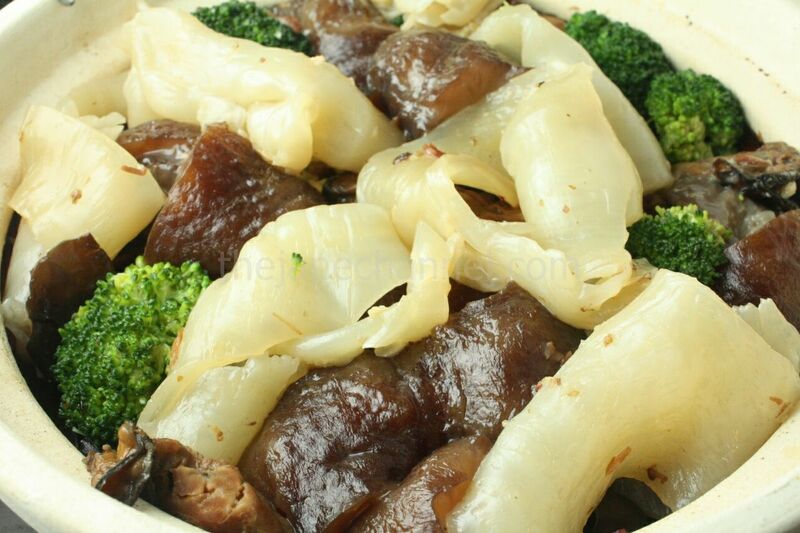 Similar to sea cucumber, fish maw is a very healthy food with many benefits. (See here) An excellent source of collagen, fish maw improves complexion, blood circulation and heals wound after operation. Some people also believes fish maw helps fertility. In a pot of hot boiling water, add 2 slices of ginger and 2 stalks of scallions, along with two fish maw. Let it cook over high heat for 20 minutes. Drain and cut into 2 inches a piece. Follow directions above to prepare fish stomach. Cut into 2 inches a piece. Soak wood ear in hot water and let it sit for 20 minutes. Drain and set aside. Heat oil in pan. Add ginger, garlic and dried tangerine peel, until fragrant. 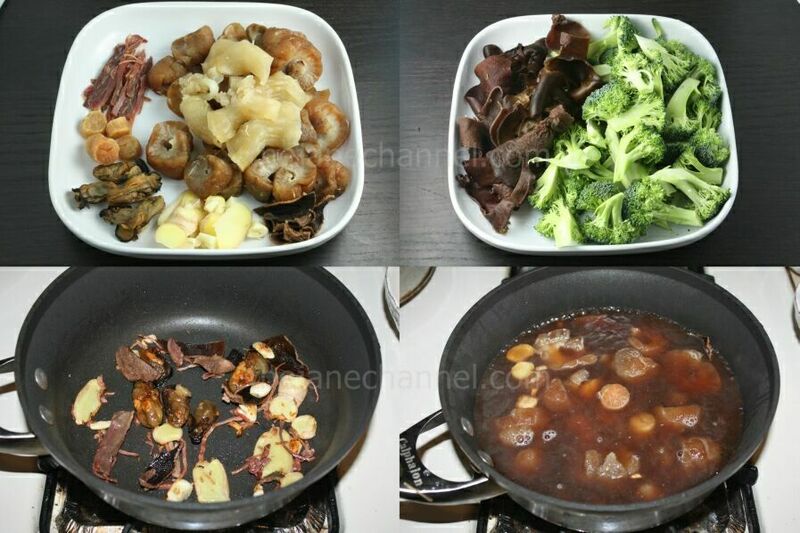 Add dried oysters and ham, stir-fry for a minute. Add in sea cucumbers and stir fry for 3 minutes. Add 2 tbsp oyster sauce, dark soy sauce, and sugar. Add 4 cups of water, enough water to cover the ingredients. Add dried scallops. Bring to a boil and reduce the heat to medium-low. Cover and simmer for 2.5 hours. Add wood ear, cover and cook for 5 minutes. Add broccoli, fish stomach and 1 tablespoon of oyster sauce, mix well, cover and cook for about 5 minutes over medium heat. Add cooking wine and cook for few minutes.